Coin. Nummus of Constantine II (317-340), issue of 330-335. Constantinople or Arles Mint, Reece Period 17. Obverse description: Diademed bust right. Reverse description: Two soldiers two standards. Star between standards. 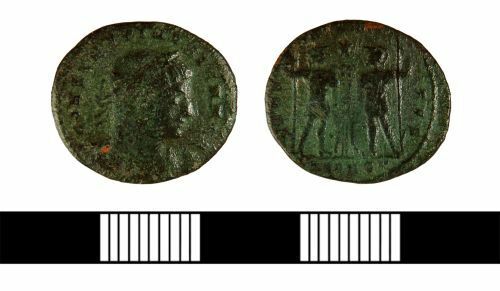 Cliff Reeves kindly examined this coin, his findings have been amended by MF. Diameter: 18.48mm, Weight: 2.29gms, die axis: 6. Reverse description: Two soldiers two standards.